Bullfighting is nothing more than a prolonged painful death - performed and viewed by people who lack empathy that an animal is suffering - and that all living beings can feel pain. Bullfighting (corridas de toros) is the classic 'Spanish style' bullfight. The bulls that are used are 4-6 years old. In each bullfight session six bulls are slain in the arena. Only professional bullfighters may 'fight' the bull. Bullfighting Portuguese style (touradas or corridas the touros): the bulls used are 4-6 years old. In each bullfight session six bulls are slain in the arena. The difference with bullfights in the 'Spanish style' is that the main matador fights the bull on horseback, and the fact that the bulls are not slain in the sight of the spectators, but in the slaughterhouse of the arena. Novilladas: bullfights with bulls of 3-4 years old which they are slain in the arena. Becerradas: bullfights with bulls aged 3 years. The bulls are slain in the arena. Rejoneos/corridas the rejones: bullfights in which the person fights the bull on a horseback. 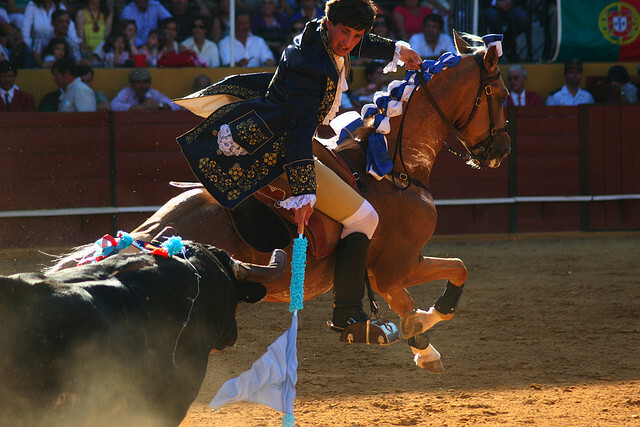 The horse gets injured regularly during this type of bullfighting. The bull is slain in the arena. 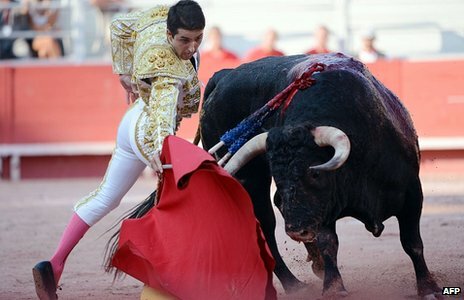 Capeas: The term capeas includes all 'amateur' bullfights, where bulls or cows are provoked with capotes ('pink' capes). During these bullfights the animals are not maltreated and/or slain. Bombero toreros/toreros cómicos: bullfights with short people and/or clowns. 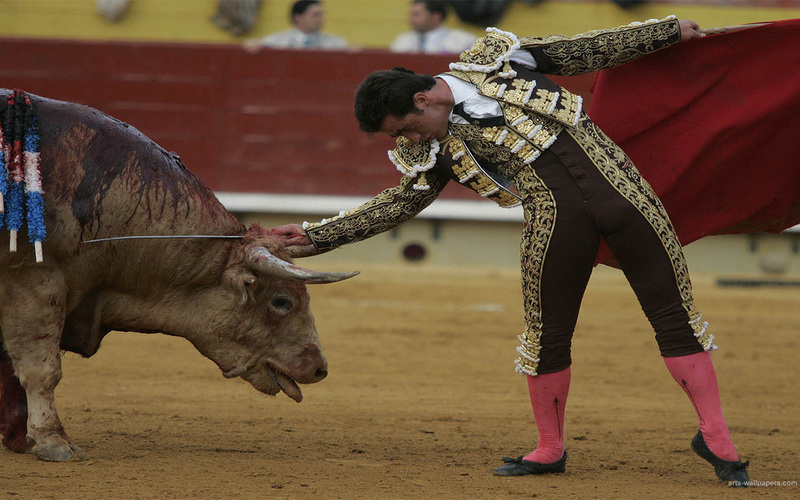 During this type of bullfighting the animals are not maltreated and/or slain. Recortadores: a person tries to jump over the bull's back or evade it without the use of capes. The bulls are not wounded or slain. 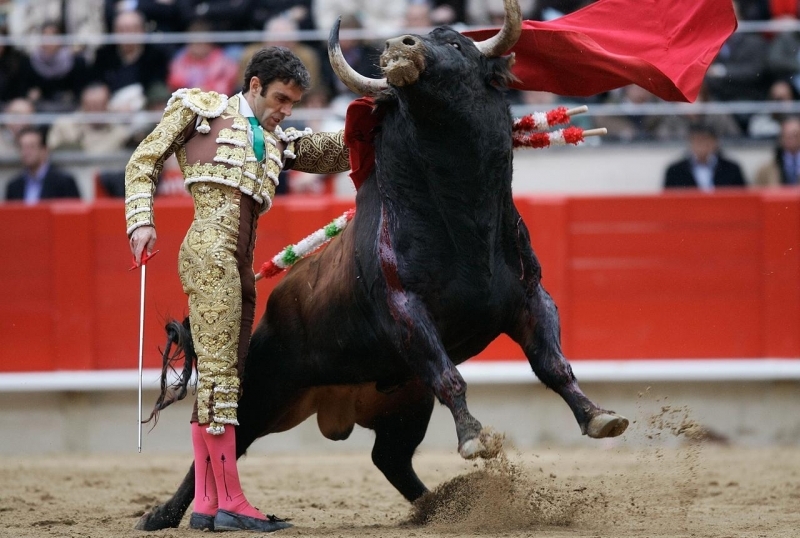 Courses Landaises: this form of bullfighting takes place only in France. During this kind of 'bullfights' cows are used instead of bulls. A person must jump over the cow's back. The cows are not slain. Courses Camarguaises: this type of bullfighting takes place only in France. The idea is to cut pieces of textile/fabric from the horns of the bulls with metal hooks. The bulls are not slain. 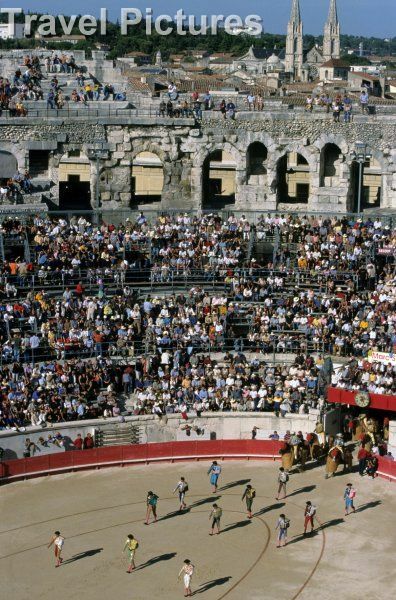 Bullfighting takes place in the south of France. Both Spanish-style bullfights and local bullfights are organized. The bullfighting season in France runs from February up until October. During Spanish-style bullfights, more than 1,000 bulls a year are killed. 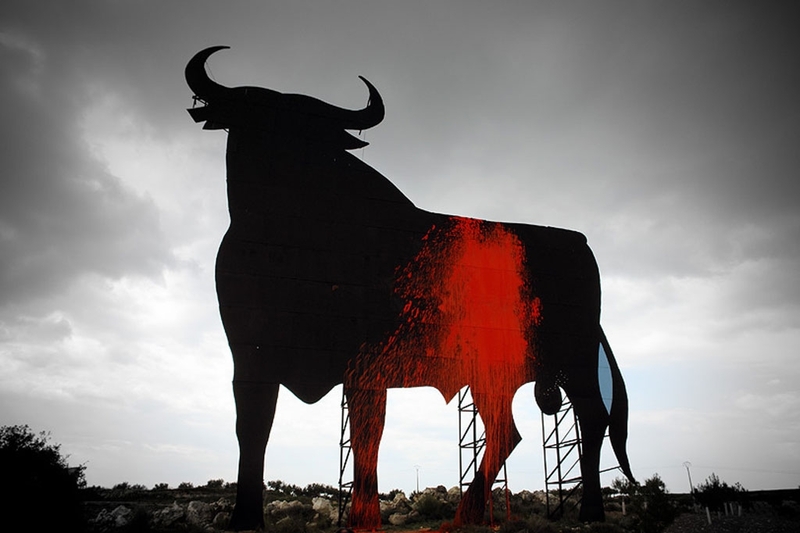 The Spanish bullfighting industry is clearly present in the south of France and the bulls come from Spain and France. 1. Corridas de Toros: bullfights with 4-6 years old bulls. 2. Novilladas: bullfights with 3-4 years old bulls. 3. Becerradas 'profesionales': bullfights with bulls younger than 3 years. 4. Rejoneos/corridas de rejones: bullfighting on horse. 5. Capeas: 'amateur' bullfighters teasing young bulls or cows with capotes. 6. Bombero toreros/toreros cómicos: bullfights with little people and/or clowns. 7. Recortadores: bullfighters avoiding bulls with dodges or jumps, without capes. Bullfighting in Portugal - Touradas Portuguese-style bullfights are called touradas or corridas de touros, and it is distinguished by the fact that the main bullfighter 'fights' the bull on a horse. It should not be confused with the rejoneo, with is a similar horse bullfight performed in other countries, such as Spain. In a typical tourada - where the bull’s horns have been filed down and covered with a leather cup to protect the horse - six bulls are used. The ‘show’ is composed by two main parts. In the first part (the most important part) a cavaleiro - a rider dressed in a traditional 18th century costume – 'fights' the bull from a horse by making the bull run and chase the horse and by stabbing different types of weapons in the bull’s back. First, the bullfighter stabs a special bandarilha (stick with harpoon-like end) which breaks on impact leaving the metal end stabbed in the bull while the wooden end stays with the rider and now reveals a small flag which is used to tease the bull to chase the horse. Then, several bandarilhas (often 6 or more), similar to the banderillas used in Spanish-style bullfighting (but a bit longer) are also stabbed into the back of the bull, to produce pain and blood loss. The second and last part starts: a group of eight men on foot called forcados challenge the bull, without protection or weapons. The front man provokes the bull into a charge to perform a pega de touros ('bull catch'), and when he does so he hangs on to the animal's head. He is quickly aided by his companions, who surround and hold on to the animal from head to tail until it is subdued. 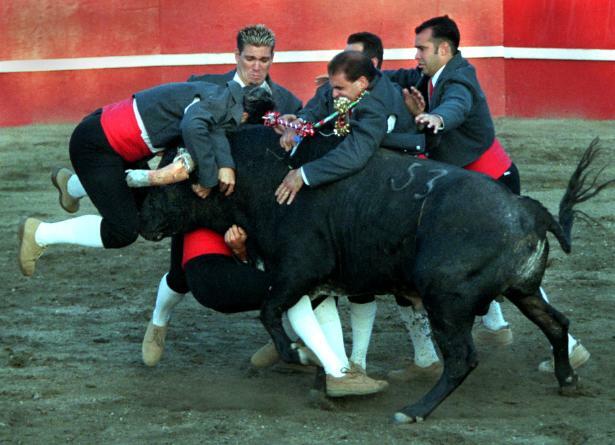 During touradas, the bull is not killed in view of the public, since this is illegal in Portugal (with the exception of some towns at the border with Spain, like Barrancos), but he is indeed killed nevertheless in most occasions. This happens behind the scenes, hours or even days after the bullfight, since often bullfights in Portugal occur on Fridays and the slaughter man may not arrive until Monday. The bull spends this time in isolation bleeding from the wounds inflicted by the bandarilhas, without any veterinary assistance. In Portugal, more than 4,000 bulls a year are killed for bullfighting and other cruel events. Bullfights are also organized on the Azores Island (an autonomous archipelago that belongs to Portugal), such as on the islands Terceira and Graciosa. Both islands have their own bullring. In Spain, several forms of bullfighting are organized. The bullfighting season runs from February up until October, during which an average of 30,000 bulls is tortured and killed. 2. Novilladas. These are bullfights with 3-4 year old bulls. 5. Capeas: 'amateur' bullfighters teasing young bulls or cows with capes. The situation has not improved for the animals in the European countries - rather the contrary. Portugal has introduced a ban to kill the bull in the arena - but often at bullfights over weekends and where the bull survived the bullfight, the bull is abandoned, badly wounded behind the scene until an authorized veterinarian arrives on Monday and kill the animal - many times, the animal had died alone in agony - before the veterinarian had time to arrived. France, Portugal and Spain are fighting by all means to keep this cruel tradition and culture alive, even though both citizens and tourists begin to lose interest in this cruel "sport". Spain has even opened up the previously banned television broadcasting to try to revitalize the interest in bullfighting. Tips for tourists - As a tourist, you can help to end bullifighting. 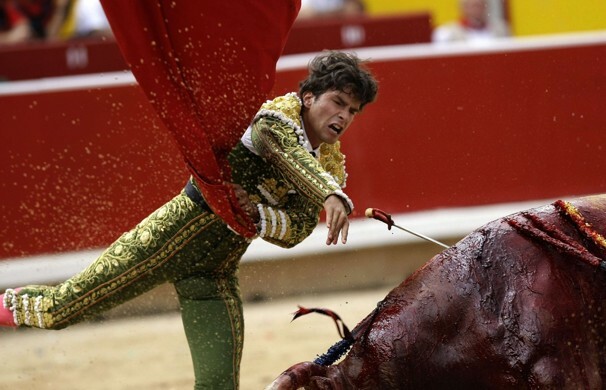 Never go to a bullfight or a cruel fiesta, not even once. If you go to these cruel events, your money and presence supports this bloody industry. Ask other people to follow your example. Do not buy any bullfighting souvenirs, especially not at bullrings. Let shop owners know (in a polite manner) why you don't want to buy these souvenirs. Do not eat or drink in bars and restaurants that promote bullfighting. Send polite letters to media and (travel) organizations that promote bull suffering. Ask the host of your travel organization to not promote bullfighting. If he/she indeed promotes bullfighting, please contact CAS, so they can address the issue.